Recent headlines confirm that the burden of EMR use is staggering. A 2016 study of ambulatory practice in the Annals of Internal Medicine concluded that for every hour spent in direct clinical time with patients, physicians devote an additional 2 hours on EMR and desk work. A 2013 analysis of EMR use in a community hospital emergency department showed that an average of 28% of physician time was spent in direct patient care and 44% on EMR data entry. This amounted to about 4,000 mouse clicks for each 10-hour ED shift. In my own experience, it took about 3 minutes to dictate an entire complex ED patient encounter using speech-recognition software while viewing a laminated dictation template. The average time required to document each patient encounter skyrocketed to 14 minutes when we adopted (or should I say “became victims of”) our first EMR system. While not everyone’s experience will be the same, I believe I can sense the collective nodding of thousands of practitioners’ heads in agreement. One of the most respected and experienced ED physicians I know resigned as a direct result of “EFS” (EMR Frustration Syndrome.) The rest of us stayed and universally developed “EBS” (EMR Burnout Syndrome). A Medscape report found that computerization of practice ranked as the third leading cause of burnout among physicians. Type faster. One workaround solution I witnessed was that one of our star ED docs typed out every patient encounter using a few shortcuts. Her fingers were a blur. This is great if you can keyboard 120+ words a minute, but very inefficient for most of us. Use a scribe. Remember my colleague with EMR Frustration Syndrome who quit? He came back to work after we promised him a full-time scribe. The scribe solution has proliferated, with some physicians refusing to work without them and others preferring to avoid them. Scribes are here to stay. Become a super-user. Regardless of which brand of EMR you use, surrender and accept the fact that EMR documentation is not going away. Instead of fighting it, own it. Learn and master all the time-saving shortcuts you can without running afoul of “copy and paste” prohibitions. Explore ways to reduce the number of clicks and spend more time seeing patients. I eventually reduced my average EMR time per chart to less than 10 minutes; others did even better. An effective survival technique, but an imperfect solution. Find and use a physician-designed documentation application. Most EHR systems were not designed by or for practitioners. 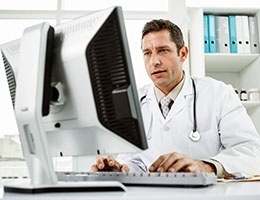 Solutions developed by physicians are now available as plug-in, add-on applications to enterprise EHR systems with the explicit aim to improve provider workflow, alleviate physician frustration, embed clinical decision support, reduce medical errors, enhance patient safety, and reduce the risk of adverse events and litigation. Although these companies think they are in the EMR business, my take is that they are really in the “make physicians’ lives easier” business. Fewer clicks, less physician burnout, safer patients, and happy risk managers at the same time? Problem solved. If you're interested in learning more about an EHR plug-in that was designed by physicians for physicians to improve documentation efficiency and patient safety, click here to read about Medical Professor.